They are services that are often vital to the public whether it is travelling to work, school, for leisure activities or shopping. 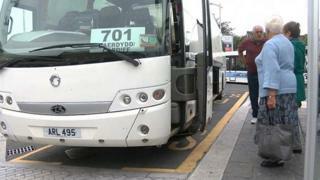 But bus companies also need to make a profit and in recent years that has proved a problem for some. In the last few months, three have gone out of business. Buses are expensive to buy and to run and the Welsh companies tend to have profits of about 7%, which is below the returns suggested by the Competition Commission. A new coach can cost £250,000, while each bus on the road costs £135,000 a year to run. Staff costs, which are on average 60% of the cost of most of the firms, have been rising as has insurance. Fuel costs have been on the increase over many years although they fell recently. They are rising again now and expected to go higher as petrol is traded in dollars so the low value of the pound will make it more expensive. August: Lewis Coaches of Ceredigion, employing 40 people, went into administration. The company had 30 coaches. Aberystwyth-Carmarthen-Cardiff bus service ended. July: GHA, based in Ruabon near Wrexham, went into administration. It employed 320 people and operated 230 vehicles on school and bus routes across north Wales, Cheshire and Shropshire. June: Silcox Coaches in Pembroke Dock ceased trading after 134 years, with 40 job losses. Other companies have fallen by the wayside in recent years. In 2013, Gwyn Williams of Tumble, based at the Derlwyn Garage, went bust while two years before that, Swansea-based holiday coach firm Diamond ceased trading. Professor Stuart Cole, a transport expert from the University of South Wales, has identified cash flow as a major problem for many bus firms. They may have contracts that can keep the business afloat but they cannot access the cash in time. He also identifies issues like companies expanding too fast and not tackling problems early enough as reasons some have been struggling. "Persuading people to admit that there's a problem, especially a family business that's been going for decades, can be difficult," said Prof Cole. He added that the Welsh Government could help, through encouraging Finance Wales loans for example, if it was aware of problems early enough. Competition has also become tighter as council funding has been cut since they are major customers of bus companies including through school travel provisions. Prof Cole says some bigger bus companies had pulled back from traditional areas, but smaller, local firms did not have that option to move away from less profitable routes. "There could also be a reluctance to reduce staff and let go of many loyal employees," he added. According to John Pockett, the Welsh director of the Confederation of Passenger Transport, ministers need to take some responsibility. "Welsh Government funding has been cut. There's a lack of certainty. Things always happen at the last minute. You can't plan ahead." The Welsh Government said despite very challenging funding settlements, its funding to councils to subsidise bus and community transport had been maintained at £25m since 2013-14. "A number of local authorities have cut their own budgets for service subsidy during the same period," said a spokesman. "In addition to the Bus Service Support Grant, we also fund a growing network of popular longer distance TrawsCymru bus services across Wales which provide essential public transport links for rural communities." TrawsCymru carried a record two million passengers in 2015-16 and a new service providing hourly travel between Swansea, Neath, Yestradgynlais and Brecon, was starting soon. The T1 service linking Carmarthen, Lampeter and Aberystwyth had also seen "particularly strong growth" alongside the rural Bwcabus.